The first day of a new Congress follows a well-established schedule, from oaths of office to leadership elections and rule changes. Here is an overview of what is in store for the first day of the 115th Congress, as described by the nonpartisan Congressional Research Service in reports for the House and Senate. —>> FOR THE HIGHLIGHTS, CHECK OUT "10 Things to Know About the First Day of Congress"
Both the House and Senate begin with a call to order, prayer led by the chambers' chaplains, and the Pledge of Allegiance. The Senate is called to order by the Vice President, who is also the President of the Senate. The House is called to order by the Clerk of the previous Congress, who asks for a roll call to determine whether a Constitutionally-required quorum (simple majority) is present. Members-elect of the House register their presence with electronic voting cards. Article I, Section 2 of the U.S. Constitution states, "The House of Representatives shall chuse their Speaker and other Officers." The Speaker is second in the line of succession to the Presidency, after the Vice President. Nominations are offered from the Floor. Debate is allowed but not customary. The vote is conducted "viva-voce": the Clerk calls members-elect by name and each says their choice for Speaker. Usually candidates for Speaker vote "present" or not at all. Once voting ends, the Speaker-elect is escorted to the dais by a bipartisan group of representatives and sworn in by the Dean of the House, its most senior member: Rep. John Conyers (D, MI-13) has served in the US Congress since January 3, 1965. Members of both chambers of Congress take the same oath of office, administered in the House by the Speaker of the House and in the Senate by the Vice President. While an oath of some kind has been administered since the first Congress in 1789, there have been several changes, most notably a "Test Oath" put in place during the Civil War, which was later removed. 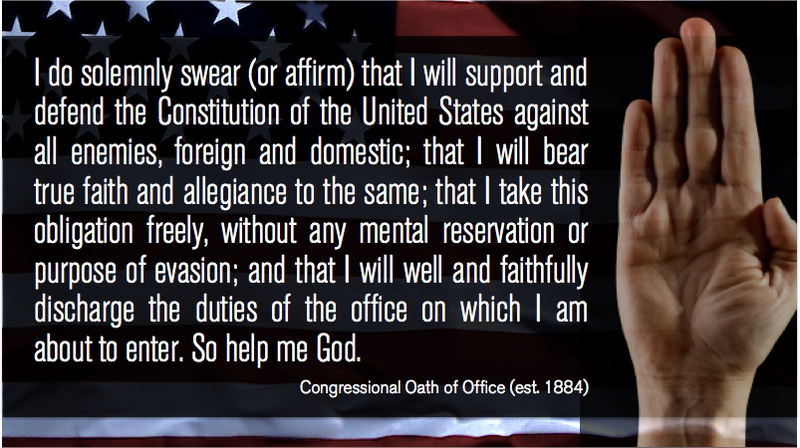 The current version of the oath of office dates back to 1884. Alerting the President that Congress is "Ready to Do Business"
The Senate is a "continuing body" because its members serve staggered six-year terms, which means that two-thirds of the Senate are serving at any time. Senate officers do not need to be re-appointed or rules re-established with each new Congress, though changes usually occur when there is a vacancy or the majority changes hands. As outlined in the Constitution, the Senate President Pro Tempore presides over the Senate in the absence of the Vice President. The President Pro Tempore is third in the line of succession (after the Vice President and the Speaker of the House) and is traditionally the longest-serving member of the majority party. Senator Orrin Hatch (R-Utah) is expected to be re-elected as President Pro Tempore for the 115th Congress. After the Speaker of the House is elected, the chairs of the Republican and Democratic caucuses report their parties' choices for majority and minority leader and majority and minority whips. Both parties present slates of candidates for Clerk, Sergeant at Arms, Chief Administrative Officer, and Chaplain. The majority party's candidates prevail, given the numerical advantage. Unlike the Senate, the House must pass new rules at the beginning of each Congress, usually by adopting the rules of the previous Congress, with amendments. "The majority’s proposed rules are offered in the form of a House simple resolution, most often numbered H.Res. 5." (CRS, 10). With members sworn in, leaders elected, and rules established, the 115th Congress can proceed to legislative business. Legislators will begin to introduce bills, which will be assigned a chronological number, referred to appropriate committees, and the Legislative wheels will begin to turn. Some Members of Congress are methodical about bill reintroduction. For example, Representative Rob Woodall [R, GA] waits every session to introduce his "Fair Tax Act" in a way that guarantees him the same bill number – H.R. 25.